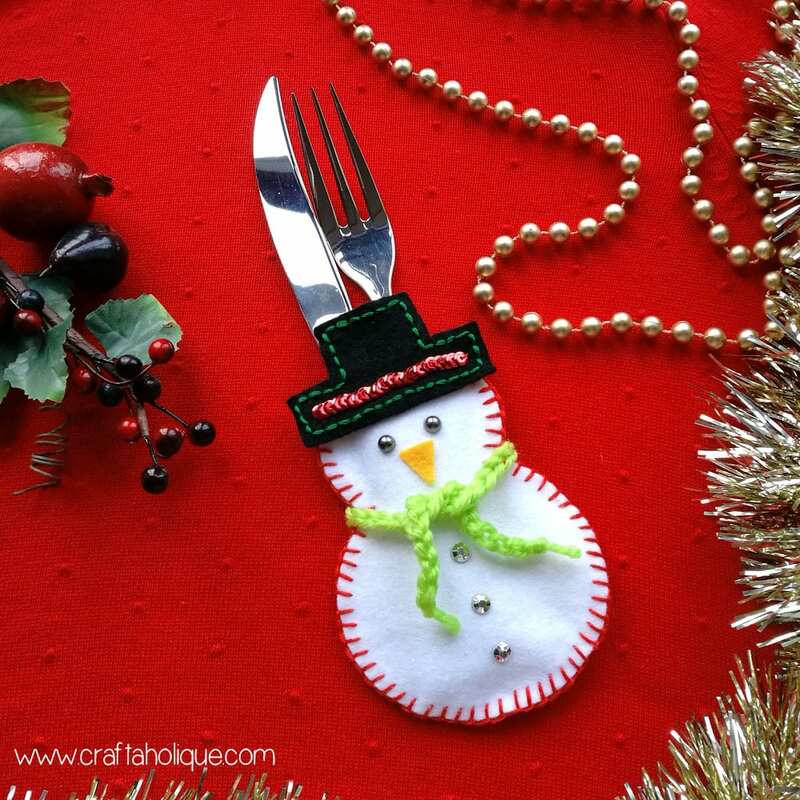 Snowman cutlery holder template – download here for free! To begin, print out the template I’ve provided for you and cut out the shapes. Draw around the snowman shape twice on white felt and cut these out. Then do the same with the hat, but on black felt – you’ll only need one of these though. 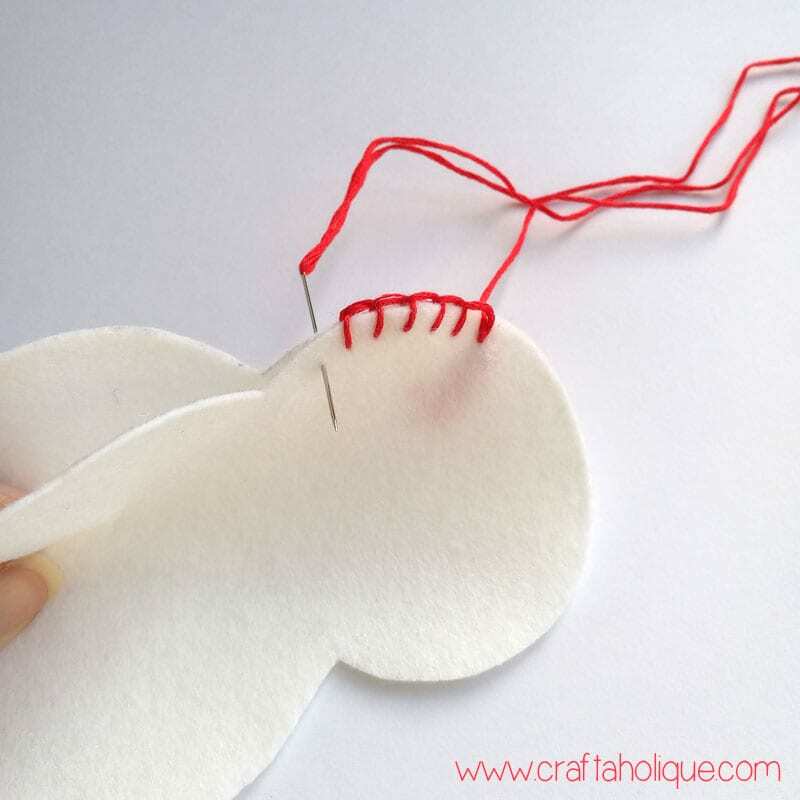 Once you have your white felt snowman shapes cut out, stitch them together using blanket stitch around the edge with the red embroidery thread. 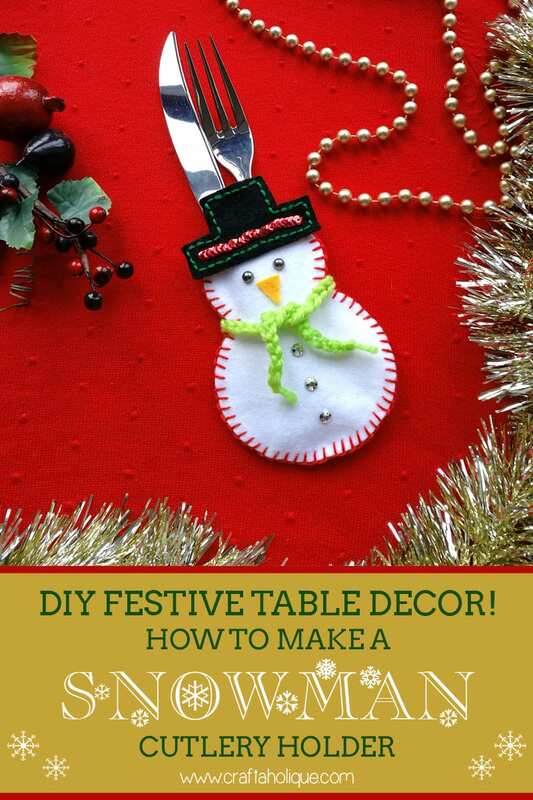 Leave the top of the snowman’s head open though as you’ll want to create a little pocket to slot your cutlery into. 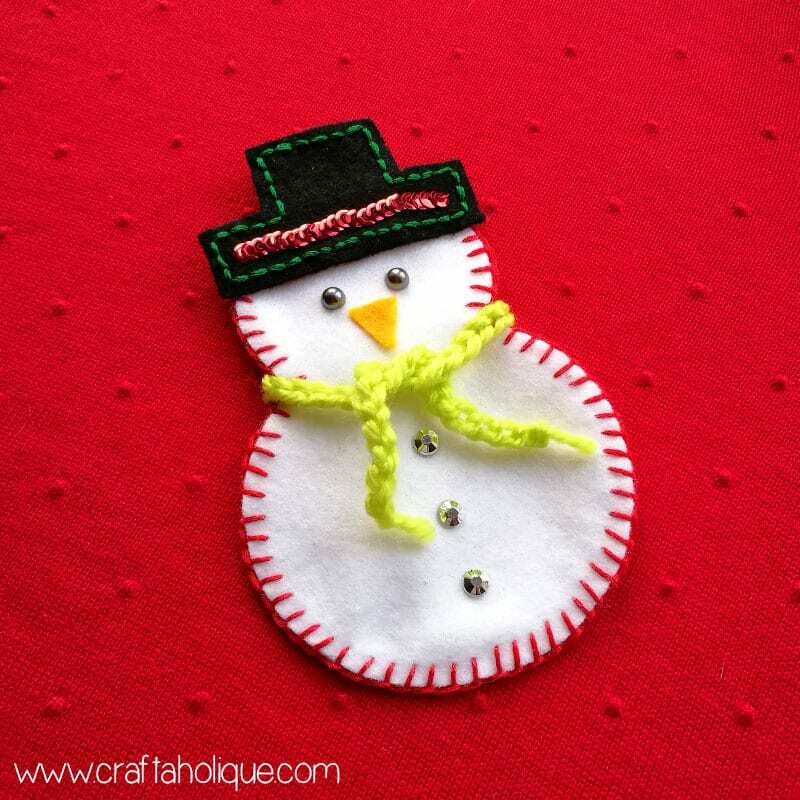 Use green embroidery thread and stitch along the edge of the snowman’s hat using backstitch. This just gives the hat a decorative effect. Then sew on a line of red sequins to create a nice little pattern on the snowman’s hat as shown in the photo above. 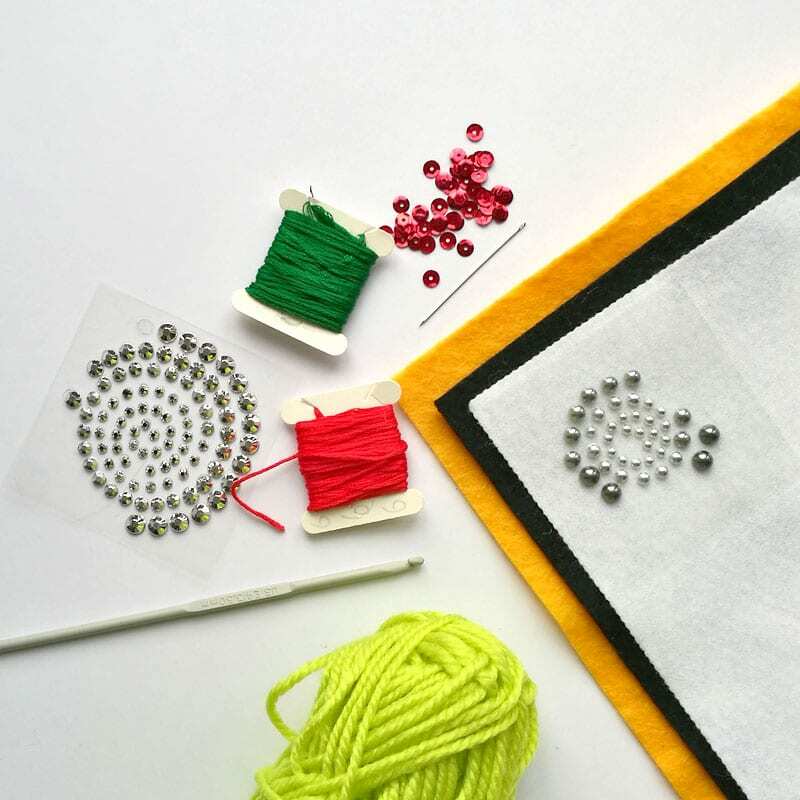 Use red cotton thread for this so that it’s hardly visible. Decide which side of the felt snowman shape you want to be the front and glue the hat onto the top part of the snowman’s head. I used gemstone glue for this as I had it to hand, but you can use fabric glue also. Then stick on the eyes (silver stick on pearls) and orange felt nose – you’ll need to cut a triangle shape out of the orange felt for this and then stick it into place. Also stick on the buttons to the snowman’s body at this point – I used stick on diamantes as buttons! Make the snowman’s scarf by crocheting a long row of chain stitch. If you’re not sure how to do chain stitch, check out this excellent chain stitch crochet video tutorial! Wrap the scarf around the snowman’s neck like you would an ordinary scarf and tie a knot. You can dab a little glue under the scarf here and there if you’d like to keep the scarf in place. Your Snowman Cutlery Holder will then be complete! Feel free to make some more so that you have enough for all of your dinner guests! I hope you enjoyed this Christmas craft idea. If you did, why not take a moment to subscribe to be kept updated of more posts like this? Please also take a minute to share this post with your social media followers online. You may also like to check these posts out before you go! 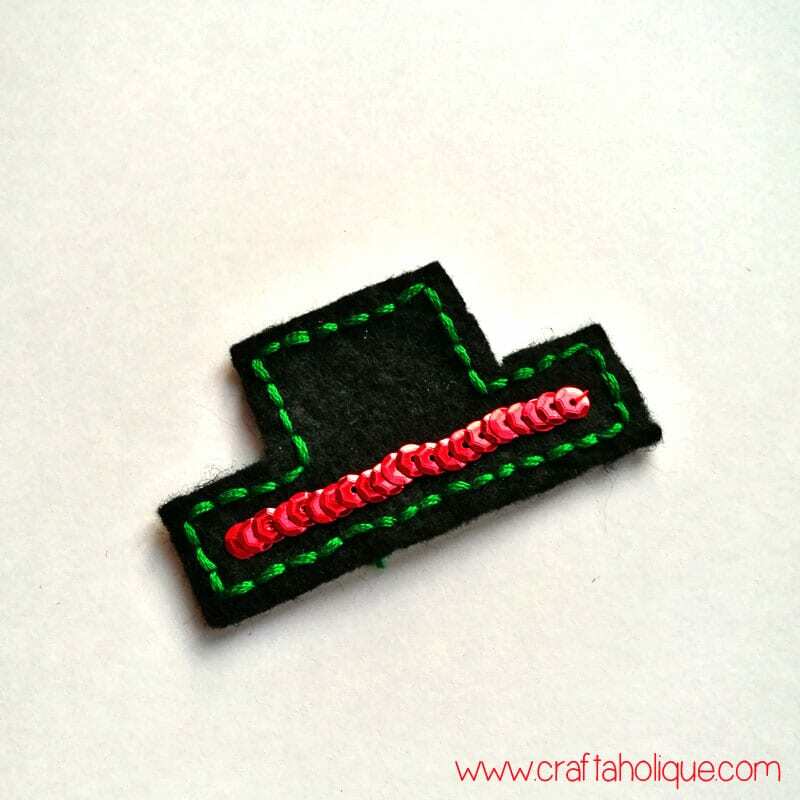 *All images are the copyright of Craftaholique.